CAMBRIDGE, ON – Grand River Brewing has announced the impending launch of a new spring seasonal beer. Amber/red in colour with a defined malt aroma. Upfront malt sweetness that dries out in the finish. Pale & Munich malts are balanced by German Hallertau Tradition and Mittelfruh hops. Very minimal bitterness, yet the standard GRB ‘back of the throat’ finish is there. Very easy drinker. 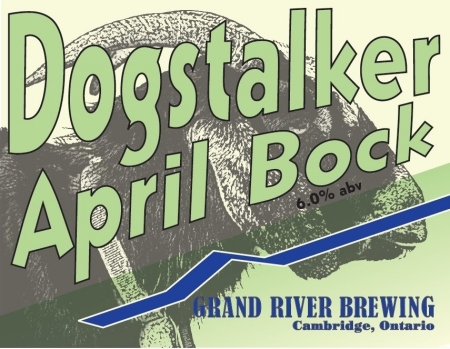 Dog Stalker April Bock will be available at the Grand River retail store starting this Saturday Tuesday April 10th while supplies last. In-store availability has been delayed a few days. Thanks, Mike – I’ve updated the post accordingly.